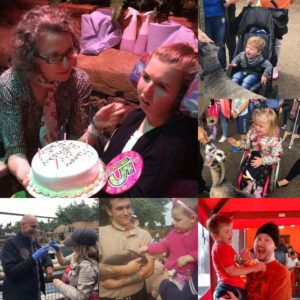 In 2016 Post Pals took 60 families with a seriously ill child for a fantastic weekend away at Chessington World of Adventures. The primary reason was to give families a break away from hospital life and to let them have fun, sadly something that lots of the children haven’t had much of. The trip turned out to be so much more than that though. 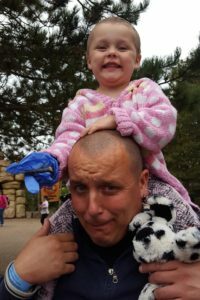 For Sophie’s family it was their first night away from home which wasn’t hospital (Sophie spent 18 months inpatient without going home once) and for the whole family to spend time together. For William’s family it was a chance to celebrate his 10th birthday together, shortly after they had found out he was now too ill for a heart transplant. 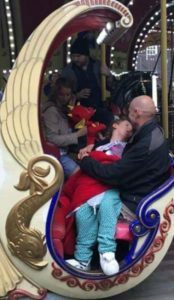 For Faith it was her first ever ride at the age of 15 as we stopped the carousel to have people lift Faith and her equipment into the princess carriage. For Jakub’s family it was their first weekend away in years, and turned out to be Jakub’s last ever weekend out of hospital before passing away. For all the families it meant a weekend of fun, laughter and making new friends, friendships that have been maintained. Going away isn’t easy for our families and we had to coordinate bedroom fridges for medications, a treatment room, making sure the children have enough bedside sockets for monitors and pumps and reduced noise in restaurants etc. 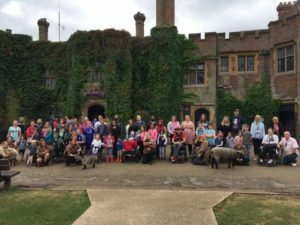 Post Pals would like to offer the Chessington experience to 70 families in April 2018. 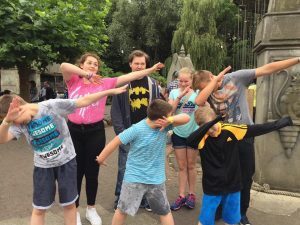 It will cost £415 per a family, this includes an over night stay in the themed Azteca Hotel, 2 days in Chessington World of Adventures (theme park, zoo and Sealife Centre), all meals and the chance to feed giraffes! We have formed a team of people to climb the O2 on October 7th but we need so much help to raise the funds! Every little helps although if you raise £415 over the next 6 months we will be able to tell you which family you sponsored and with their permission even share photographs with you. Any businesses, charities or groups who donate will be credited and links shared. So get baking (bake sale), bag packing (supermarket bag pack), climbing, auctioning or anything you can think of! Together we can provide amazing memories to the families we help.